The Red Sox have secured the face of their franchise through the 2021 season. 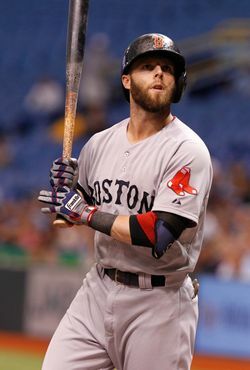 The team today officially announced the signing of second baseman Dustin Pedroia to an eight-year extension that will take effect in 2014. Pedroia, who is represented by ACES, will reportedly receive $110MM over the life of the contract. Prior to this agreement, Pedroia was on a contract that paid him $10MM in 2013 and 2014 with a team-friendly club option for $11MM in 2015. The fresh contract will start in 2014 and slightly increase his salary next season but provide the Red Sox with an average annual value of less than $14MM for the four-time All-Star and 2008 American League MVP. In essence, he is receiving seven additional years and $100MM in new money. Pedroia will reportedly receive a $1MM signing bonus before earning $12.5MM in 2014-15, $13MM in 2016, $15MM in 2017, $16MM in 2018, $15MM in 2019, $13MM in 2020 and $12MM in 2021. The contract also contains some deferred money and a full no-trade clause. We learned late last week that the Red Sox had begun talks with the soon-to-be 30-year-old on an extension. It’s possible that the Red Sox were motivated by Robinson Cano’s impending free agency to lock up their own standout second baseman. A colossal deal for the Yankees star would ostensibly raise the bar for players at that position. In 449 plate appearances this season, Pedroia is slashing .308/.385/.422 with six home runs. For his career, the four-time All-Star owns a career slash line of .303/.371/.457. In addition to his bat, Pedroia delivers plenty of value with his glove, as he’s consistently among the best fielding second basemen in the game. Ultimate Zone Rating suggests that Pedroia saves 9.5 runs per 150 games played, while The Fielding Bible feels that he’s been 74 runs above average over the course of 8192 1/3 innings at second base. To date, Fangraphs pegs Pedroia’s value at 32.3 wins above replacement, while Baseball-Reference values his on-field contributions at 36.2 WAR. Pedroia’s contract tops the previous deals signed by superstar second baseman such as Chase Utley, Ian Kinsler and Brandon Phillips (also an ACES client). By signing this deal, Pedroia will become the first second baseman to receive a contract of $100MM or more. The new pact represents the first significant contract extension by Ben Cherington since becoming Boston’s general manager, though Cherington did work out a two-year deal to avoid arbitration with left-hander Craig Breslow. Rob Bradford of WEEI.com was the first to report the extension and the full no-trade protection (Twitter links). WEEI.com’s Alex Speier provided the year-to-year breakdown of Pedroia’s contract (on Twitter).